WASHINGTON (AP) — A financial-exchange executive said Tuesday that Jon Corzine might have known that MF Global tapped clients' money to lend to a European affiliate of the firm. CME Group Inc. Executive Chairman Terrence Duffy told a Senate panel he had received information that Corzine knew about a transfer of $175 million from customer accounts. Corzine, a former senator, has testified that he didn't know any customer money was missing until Oct. 30, the day before MF Global became the eighth-largest bankruptcy in U.S. history. About $1.2 billion of customer money was unaccounted for when the company collapsed. According to Duffy, an MF Global employee told a CME auditor that "Mr. Corzine was aware" of the loan. Duffy told the Senate Agriculture Committee that he's referred the matter to the Justice Department and the Commodity Futures Trading Commission, which are investigating MF Global's failure. Duffy said he received the information last weekend from CME Group attorneys who are investigating the matter. MF Global traded on exchanges managed by CME Group. Brokerage firms are required to keep client money separate from company funds. Depending on the circumstances, transferring money from customers' accounts could violate securities laws and, in some cases, could amount to a crime. A Corzine representative had no immediate comment on the allegation. Corzine rose from Goldman Sachs' trading floor to become co-chairman of that firm, before serving as a senator and governor of New Jersey. After becoming CEO of MF Global in March 2010, he tried to transform the futures brokerage into a full-fledged investment bank. MF Global failed after a calamitous bet on European debt spooked its investors, trading partners and clients. Corzine resigned as CEO last month. Earlier Tuesday, Corzine told senators he once served with that he never told anyone to "misuse" customer money that vanished when MF Global collapsed this fall. Brokers are required by law to keep customer money separate from company money. Senators demanded that Corzine and two other executives from the securities firm explain who authorized the transfer of money in the days before the firm became the eighth-largest bankruptcy in U.S. history. "I never gave any instruction to anyone at MF Global to misuse customer funds," Corzine said. Bradley Abelow, the firm's president and chief operating officer, and Henri Steenkamp, the chief financial officer, also tried at the hearing to distance themselves from any decision to transfer customers' money. All three witnesses said they don't know where the missing money is. Yet their phrasing varied in subtle ways that could have legal distinctions. Corzine said he did not direct anyone to "misuse" clients' money. Abelow said he does not recall "any conversation about customer funds being used for anything other than their intended purpose." Steenkamp's stance was more sweeping. He said he did not "authorize, approve or know of any transfers of customer funds" out of their accounts. But several senators expressed frustration with the executives' insistence that they didn't know who might have authorized the transfer of clients' money. "Funds don't simply disappear," said Kansas Sen. Pat Roberts, the committee's top Republican. "Someone took action, whether legal or illegal, to move that money. And the effect of that decision is being felt across the countryside." Roberts said MF Global violated "a sacred rule of the futures industry," under which customers' money remains segregated from the firm's. "You don't break the glass in regards to segregated funds," Roberts said. As the senators drilled into who might have authorized the transfer of funds, Corzine pointed to the role of the firm's treasury operations department. "The people who headed that were probably closest to the scene of the action," he said. Roberts noted that the department ultimately reported to Abelow. The committee is continuing its investigation of MF Global. Chairwoman Debbie Stabenow, D-Mich., said staffers are interviewing MF Global employees, "asking for an accounting of checks and balances — who was in charge." Added Sen. Mike Johanns, R-Neb. : "Somebody in this organization had to have the ability to say, 'Light's green, take the money.'" Corzine and Steenkamp said that given what's now known, they wouldn't have signed the firm's last quarterly financial statement attesting that its internal financial controls were adequate. Under a 2002 anti-corporate-fraud law that Corzine co-wrote as a U.S. senator, the CEO and chief financial officer of public companies must personally certify the accuracy of their company's financial statements. It can be a violation of the law for executives to sign a false statement. The three executives say that they didn't become aware of the shortfall until hours before the firm filed for bankruptcy protection on Oct. 31. Tuesday's hearing included an added element of intrigue: Corzine was pressed by some of the senators he served with from 2001 through 2005. The Senate panel is one of three congressional committees to have issued subpoenas to compel Corzine's testimony on the issue. It marked the first time a former senator has been subpoenaed by his former peers in more than 100 years, according to the Senate historian's office. 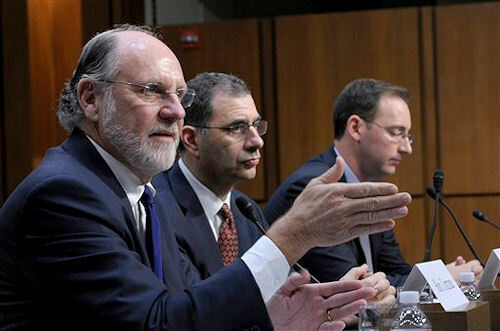 Corzine told lawmakers that he never intended to authorize the transfer of funds from customer accounts. He said he doesn't believe "it would be possible" for anyone to misinterpret anything he said as authorizing the misuse of customer funds. Corzine, Steenkamp and Abelow have been sued in class-action complaints on behalf of MF Global shareholders. The lawsuits accuse the executives of making false and misleading statements about MF Global's financial strength and cash balances. MF Global didn't list the European debt on its balance sheet for all to see. Instead, those holdings were shifted to the company's "off-balance sheet," deep in its financial statements. Some separate filings with regulators excluded the European debt entirely. A lawyer for the trustee overseeing the liquidation of MF Global's brokerage operations said in court Friday that the trustee's staff has discovered some "suspicious" trades in MF Global customer accounts that were made in the last days before the firm failed. The lawyer didn't provide details.